1. Check your medicine cabinet. 3. Ask yourself if you are honestly prepared for all the bumps, bruises, and hygiene issues your kids are likely to encounter this fall. If you admitted that your stock of supplies is getting a bit low, we have great news for your bathroom closet AND your wallet! On July 29th (that's THIS SUNDAY), a special Healthy Essentials coupon insert in your local newspaper and online at www.healthyessentials.com will provide $175 in savings on all your favorite products. 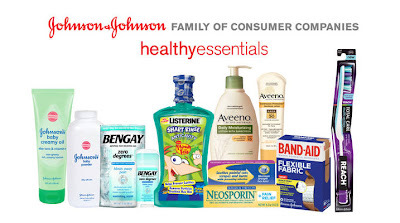 These are brands that my family uses everyday, including Band-Aid, Neosporin, Reach, and more! Those of you who clip coupons should be excited to stretch that back-to-school budget even further. Those who haven't really gotten into couponing should find at least one or two savings offers that fit your shopping lifestyle. AVEENO® Continuous Protection for Face SPF 30 ($8.99-$11.99): Perfect for the whole family, especially your athletes who are outside on the playing field this fall! This powerful sunscreen provides high, broad and photostable UVA/UVB protection against the sun’s harmful rays, specially formulated for the face to be oil-free and non-greasy. AVEENO® Daily Moisturizing Lotion SPF 15 ($9.49-$9.99): Colloidal oatmeal and rich emollients moisturize your skin for up to 24 hours while providing UVA/UVB protection. Ideal for mom on-the-go to keep skin soft, smooth and protected! REACH® TOTAL CARE Multi-Action Toothbrush ($5.09): Teaching good brushing habits just got easier with this multitasking toothbrush – specially designed bristles clean in multiple directions with each stroke, helping you remove up to 90% of plaque. LISTERINE® SMART RINSE® PHINEAS AND FERB™ ($5.19): Specially designed just for kids, this post-brush mouth rinse with fluoride – an important ingredient to help provide extra cavity protection – provides 12-hour cavity protection and strengthens teeth 99% better than brushing alone! JOHNSON’S® Baby Powder ($3.99): It’s a tried and true classic. JOHNSON’S® Baby Powder leaves skin feeling soft and fresh, while helping to eliminate friction to keep skin feeling cool and comfortable. JOHNSON’S® Baby Creamy Oil ($3.99): Classic JOHNSON’S® Baby Oil gets a rich makeover with Aloe Vera & Vitamin E. With a sweet yet subtle fragrance, it’s an indulgence for mom and something the kids will love as well! NEOSPORIN® and BAND-AID® Flexible Fabric ($4.77 - $9.07, $6.99): A staple in every family’s first aid kit and a match made in healing heaven. From the #1 doctor-recommended brand, NEOSPORIN® First Aid Antibiotic Ointment kills more types of infectious bacteria in laboratory tests than even the leading topical prescription antibiotic. BENGAY® Zero Degrees ($13.99): BENGAY® introduces this unique stick that can be stored in the freezer and provides an instant, icy cold sensation. It’s perfect for mom to throw in the cooler for soccer practice, long hikes, or wherever your active family takes you! To be entered to win, just comment on this post with which of these products your family uses during the school year. You have until August 9th at 11:59 pm CST to get your entries in. One entry per person, and we will pick one winner at random from all eligible entries. This giveaway is open to U.S. residents ages 18+. See our full rules here. *Prizing provided by J&J. Opinions are 100% my own.